I read an interesting article in the pilot issue of the Classic Wargamer's Journal in which Stokes Schwartz discusses painting large units and how to avoid losing momentum. That's basically what has happened to me in my project; I have lost momentum. Stokes makes the point that painting the smaller details earlier helps. That way you finish with the big stuff. I've been trying to figure out how to do that - not really sure how you paint buttons on lapels before you paint the jacket, but I thought I would try to give it a try on the next batch. For now, I am mired in painting muskets (four more to go) and shako plates for 20 shakos. I am dreading that last piece. That brings me to my point: how many people out there, when mounting figures singly, paint to an "acceptable point" and then go back and add the details later? I was thinking of doing that - stopping now and varnishing the figures - and then moving on to another unit. When the 'detail freak' comes out, I can paint one or two shako plates. I'll love to hear your thoughts, either here or on the Wargaming on a Budget forum. I've decided to give the rules Sharp Practice by Too Fat Lardies a go - I've owned these rules since they were released - using these figures. 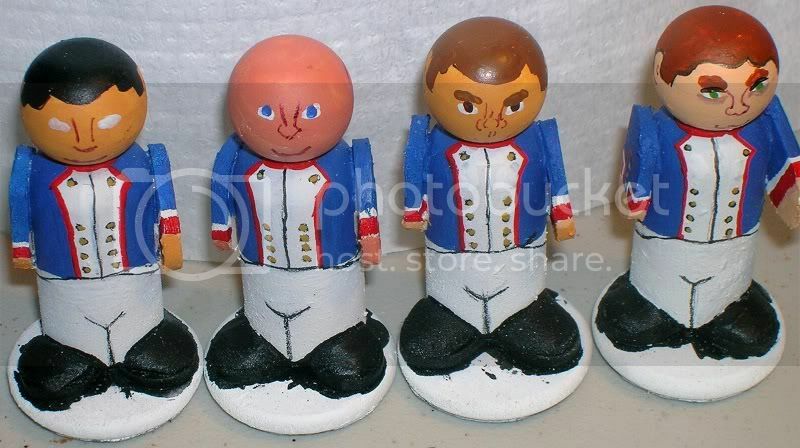 In addition to using them for Command & Colors: Napoleonics, of course. The next unit should be something usable, like British Lights, but I want to do some cavalry, so I will probably do the King's German Legion Light Dragoons. Back to the tutorial. The next part can take a lot of time, if you let it. Now we are going to paint the faces. First I start out by drawing the nose, bridge, and chin with a brown pen. This helps define where everything else will go. Go crazy with different types; it will give each figure character. Next, I define the ears a little better with the brown pen. Again, don't be afraid to make different shapes. Next, I do the eyes in stages. The picture below shows, from left to right, the steps I follow. Paint an almond shape in white for the eye. Don't worry about being perfect as the other colors will define the final shape. Paint the iris color. 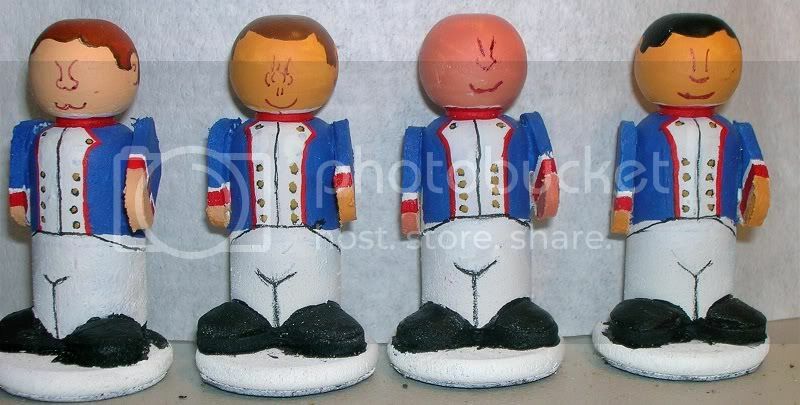 Most should be brown, unless the ethnicity of the figure dictates otherwise. Here I have painted the eyebrows next using the figure's hair color (or a darker shade). Paint a thin black line on the top of the eye for the eyelashes. Paint a darker shade of flesh on the bottom for the "bags" under the eyes. You might find it easier to switch steps 3 and 4. If you want a flesh colored gap between the eyelash and eyebrow, it is easier to reverse the steps. Finally, I paint the mouth. As I still don't have a satisfactory method there, I am going to cop out and leave that for when I do. For now, you can draw a thin line with your brown pen so the chin won't look like the mouth. I think jig is the proper word. If not, someone let me know. 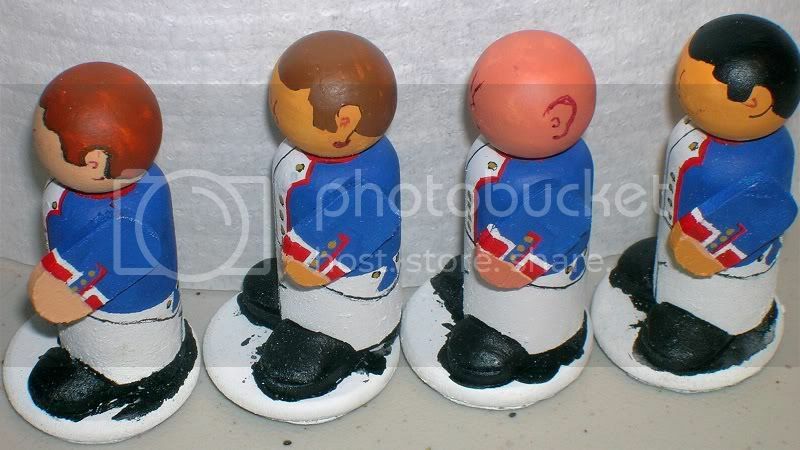 My Napoleonic figures have been on semi hold for a while as I was waiting for a new mini-miter saw (see last blog entry) to cut the wooden spools in half, which serves as the basis for the shakos. Just one little problem: the round spools did not want to sit in the vise nice and tight so while I was cutting, the spool would shift, leaving me with an angled cut! What I needed was something where the sides were flat, so the vise could get a proper purchase, but would also fit around the spool's curved surface, gripping it properly. So, I needed to make a custom vise, or a jig. I started by measuring the inner and outer diameters of the spool. By inner I mean that portion where the thread wraps around. The outer portion is the widest part at the top and bottom. The inner measurement was 5/8" while the outer portion was 3/4". I took a wood strip (from another project) and bored out a 5/8" hole about one-third of the way through the strip. Notice that the tip of the borer penetrated to the opposite side (the white hole) allowing me to find the center on the opposite side. This was necessary because I then took a 3/4" borer to bore out the opposite side. With the hole properly bored the larger end of the spool will fit in the 3/4" hole on one side and the smaller center of the spool will fit in the 5/8" hole. Note that the spool used in the picture below has already been cut in half. The next step is to cut the block in half so that it resembles a two-part mold. Each part will wrap around a whole spool acting as a gripper for the vise. The second picture shows you how the spool fits the two sizes of holes nicely. Here is the jig in action. In this case I simply lopped off the top of the pawn so it would glue flush with the bottom of the spool. In the past I used modeling material to fill the spool's hole, but given that its diameter is 1/4" I decided to try both 1/4" flat head plugs and 1/4" dowel; both worked fine although the plug required a tap hammer and the dowel required glue to hold it in place. While I was experimenting, I actually purchased one 1/4" round head plug by mistake and noticed it made a nice pom-pom, if a little large. I will look for smaller ones and consider using those rather than the heads of dressing pins for the pom-poms, further saving construction time. The larger wooden pom-pom is a little exaggerated, but that is probably good. My new miter saw is in! Woo hoo! My new miter/chop saw from Micro-Mark is in! UPS could not find me way out where I am, so it was not there waiting for me when I came back from vacation. Expect to see me start to finish off the French, now that I have an easy means of cutting the spools in half to finish off a batch of shakos. I may even try lopping the tops of some game piece heads so I can simply glue the spool to the game piece (pawn), as Just suggested, and save even more time making these guys.